Loved by many, loathed by others and the subject of gossip to most, Catherine the Great is one of history’s most influential female rulers. By day this enlightened despot plotted military conquests. By night she hosted gala dinners, with great artworks and artifacts lining her palace walls. She had numerous lovers and illegitimate children and may have been behind her husband’s assassination. Catherine the Great (1729–1796) reigned for 36 years until her death and was one of Russia’s most commanding leaders. But this woman whose name echoes through Russian history was born in Prussia, with the name Sophie von Anhalt-Zerbst. She was the topic of gossip by her subjects and historians alike. She loved art, compiling the biggest collection in the world at the time. She created Russia’s first orphanage. We know a lot about her, but there are many gaps that have been filled by speculation and innuendo. The exhibition Masterpieces from the Hermitage: The Legacy of Catherine the Great at the National Gallery of Victoria weaves together an alternate biography of Catherine the Great, telling her story via the objects and artwork she collected, including artists such as Rembrandt, Velasquez, Rubens and Titian, all on loan from the Hermitage Museum in St Petersburg. The University of Melbourne is the education partner of this exhibition. Many historians speculate she was involved in the murder of her husband, Czar Peter III, who was in power only six months before he abdicated as tensions mounted and Catherine gained the support of Russia’s most powerful military regiment. Following his abdication, Catherine was declared the sole ruler of Russia. Eight days later the former czar was murdered by Alexei Orlov, who was the brother of Catherine’s lover at the time. Professor Peter McPhee, an historian at the University of Melbourne, considers Catherine the Great as one of the most ambitious and active rulers in history. As soon as she came to the throne she launched into a campaign to reform Russia. 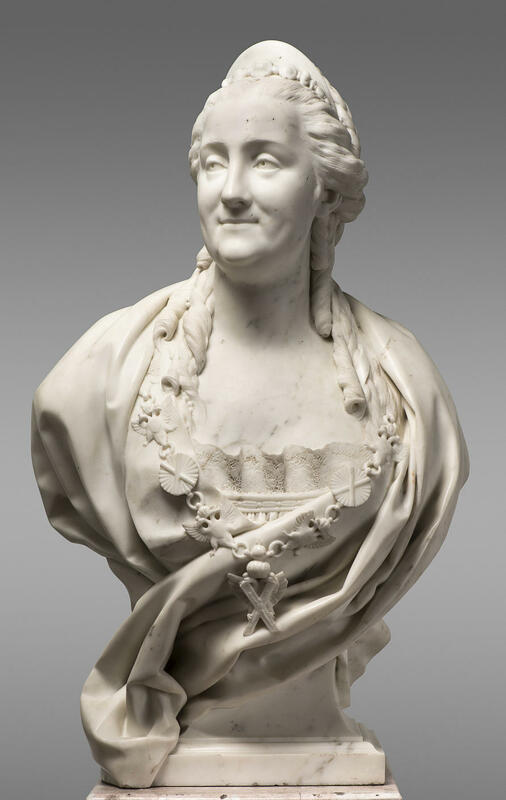 “Catherine sought to bring Russia in line with the goals of the Enlightenment. She looked to the philosophers of France, like Voltaire and Diderot, to create a vision for Russia,” said Professor McPhee. But at the same time, she expanded the Russian Empire dramatically, incorporating parts of Ukraine, Crimea, Belarus and Lithuania. These historically re-drawn borders and their inclusion into Catherine’s Russia underpin current tensions and relations in the region. “At the time, this radical expansion was seen as bringing greatness to the Russian Empire,” said Professor McPhee. 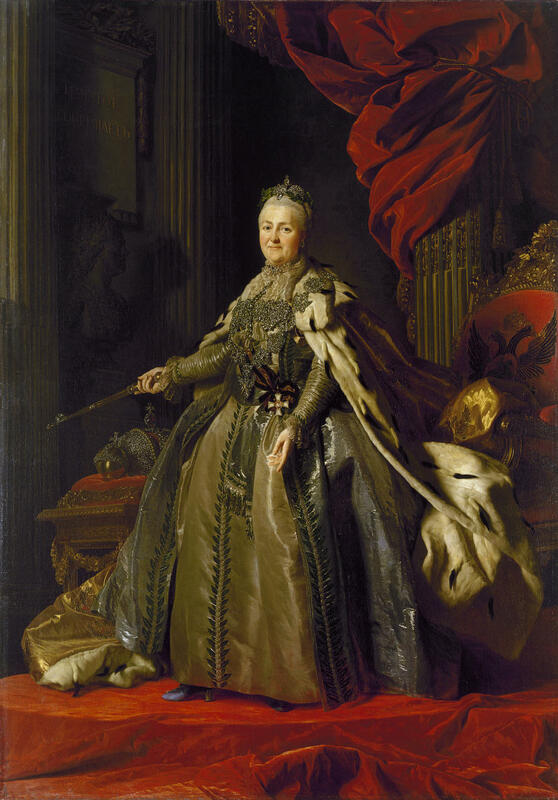 Catherine the Great’s reign survived more than a dozen uprisings. She was the master of a powerful army and was able to respond to dissent with massive force. Catherine the Great also introduced paper money to Russia. Due to her heavy expenditure of silver and gold on the military, there wasn’t enough currency left for the public to conduct large transactions. So in 1769 the bank she created, the Assignation Bank, introduced the paper currency that would be used until 1843, the Assignation Ruble. The many lovers taken by the Empress were an open secret in Russian court. Her lovers received titles, land and palaces. One received a gift of more than 1,000 serfs. Another Stanislaw Poniatowski, who is believed to have fathered at least one of her children, received Catherine’s support to be installed as the King of Poland. Catherine the Great also sought to address many internal social issues. She created the Smolny Institute to advance the education of Russian noble women. She also created Russia’s first orphanage in 1764. This was a highly idealistic project, and during her 32-year reign, over 40,000 orphans were admitted to the orphanage. The orphanage aimed to teach literature, religion and trades to street children, however it was seen as a mixed success as the infant mortality rate was very high. Looking beyond the military conquests and the institutions she forged, many parts of Catherine the Great’s legacy are shadowy and ambiguous. Her legacy is obscured by the many layers of rumour and ridicule combined with the agendas and biases of different historians. Professor McPhee notes that much is disputed about Catherine’s life, from who fathered her children to how she died. One of the great difficulties in trying to understand Catherine are all the myths around her. There are two common myths of Catherine the Great, he said. The first was one that she encouraged: Catherine the wise ruler. “Catherine likened herself to Minerva, the goddess of wisdom. This is the gilded view of her. Catherine the Great, the larger-than-life, benevolent, intellectually enlightened, politically astute leader,” explained Professor McPhee. According to this view, she was a reformer who modernized Russia. Those who see her in this way cite the institute of free trade she opened, as well as the Smolny Institute and the Moscow Orphanage. The second myth was one of sexual perversity and barbarism. “This myth cast Catherine as a tyrannical, brutal leader who is also ruled by sexual conquests. It sees her as presiding over a society that is based on violence,” said Professor McPhee. This vision of the Empress highlights the continued suppression of serfs and views her reformist values as superficial. “Of course, she’s not the only powerful woman in history who has been stigmatized and vilified because of her gender,’’ he said. 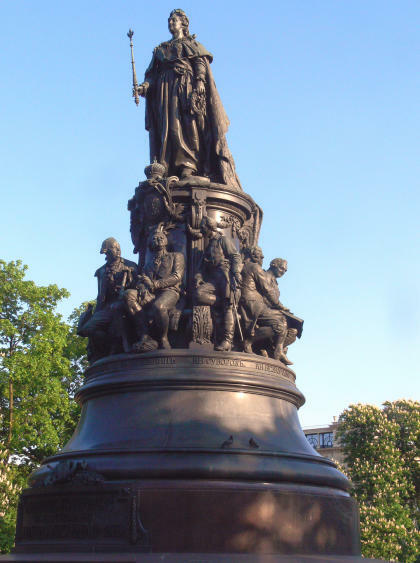 Monumental leader: The commanding statue of Catherine the Great, unveiled in 1873, looks over St Petersburg. Picture: Wikipedia. Soviet Union historians supported this view, casting her as a tyrant who oppressed the people. According to this view, she was the chief beneficiary of an unequal aristocratic system. The exhibition documents the Empress’ great dedication to art and high culture, as well as her view that artwork feeds the intellect and insights of a ruler. It shows her as a European who was fascinated by China and had a profound taste for orientalism. It also pays homage to Catherine the Great as a character, connoisseur and collector of art, as well as her pivotal role in the Hermitage Museum’s history and foundation. The Faculty of Arts will be hosting a four-part master class in partnership with the NGV, exploring some of the intricacies and historical questions that arise from the exhibition Masterpieces from the Hermitage: The Legacy of Catherine the Great. Banner image: The Hermitage Museum, the Winter Palace in Winter, St Petersburg. Photo: Andrey Terebenin.